It's the year we've been waiting for since 1985, and a day we've been waiting for all year! (Does that make sense?) It's BACK TO THE FUTURE DAY, the exact calendar date and year that Doc and Marty traveled back...err, forward...to in Back to the Future Part II. We know that you BTTF fanboys and fangirls don't ever need a reason to celebrate this famous film trilogy, but we're just sayin', if you've got a self-drying coat or a Hoverboard lying around, today is THE day to bust them out. If wearing Back to the Future clothing isn't quite enough for you today, we've compiled some other resources for you, from themed crafts to DeLorean infographics, to collectible figurines. So come on! 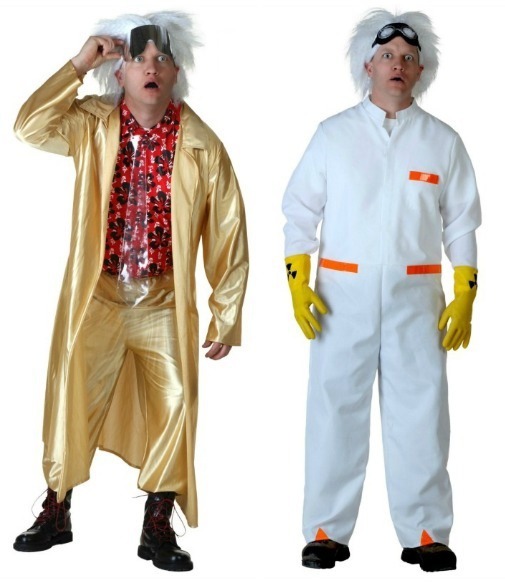 Celebrate Back to the Future Day with HalloweenCostumes.com! Maybe a local pub is hosting Back to the Future themed trivia this evening? Lucky you! You best brush up before you attend, though, and we've got some awesome infographics and visual guides to help you do just that. 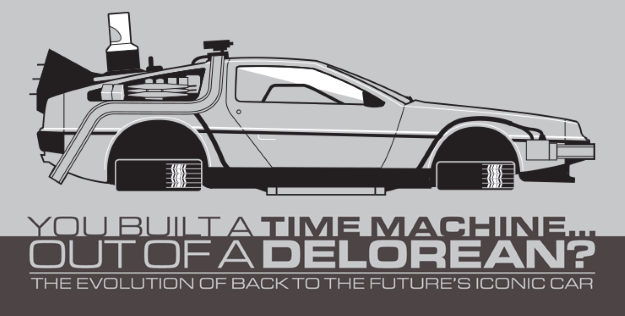 You built a time machine...out of a DeLorean??? Classic. If you're a car guy, or, we guess, if you're a time machine guy, then take a look at our illustrated guide to all the times the DeLorean appeared in the Back to the Future films. Less into mechanics, and more into fashion? We hear you! Click on the image above, and you'll be able to see a hand-drawn guide to just about all of the famous 80s costumes featured in BTTF. 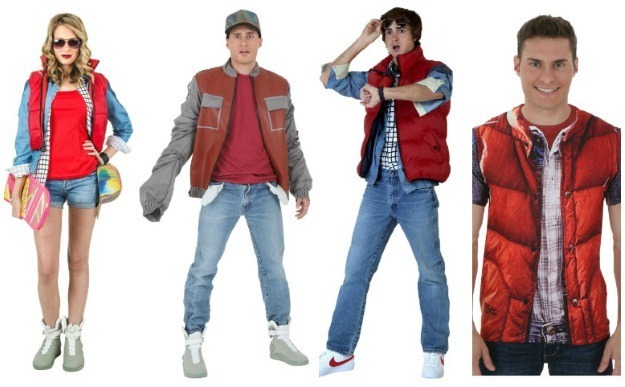 We've included Marty's looks (duh), Doc's fashions (duh), and even BIFF'S wardrobe (not so duh)! Yes, reading is fun, but you're more of a DO-ER! We get that. Here are some themed quizzes and crafts sure to wet your BTTF whistle. Take A Back To The Future Guitar Moves Quiz! You know that famous "Enchantment Under the Sea" dance scene, where Marty turns into a rock god? Of course you do, or you probably wouldn't be reading this post! But just how WELL do you know it? Each of Marty's guitar dance moves were actually inspired by a famous rocker. Take our quiz and see how many you can identify. Haven't you heard? Cross stitch is hip again! In fact, it's probably hipper than using the word hip! 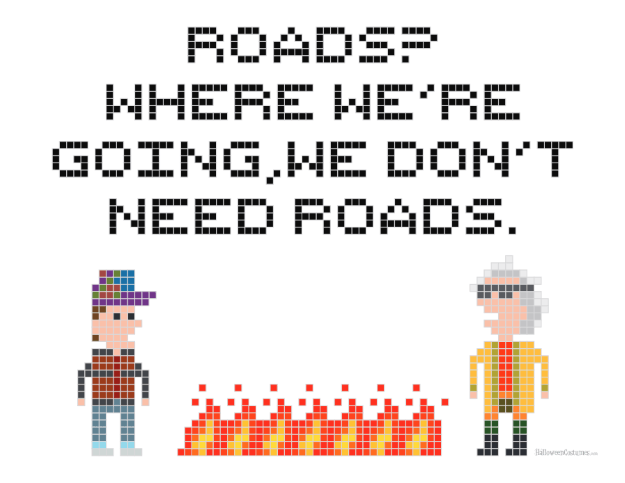 Whether you're a seasoned cross stitch veteran, or you're just starting out, this famous BTTF quote can unite all levels of crafters. Click the image above to be taken to the free printable PDF form of this pattern. One of the best parts of the whole film series are those famous shoes! 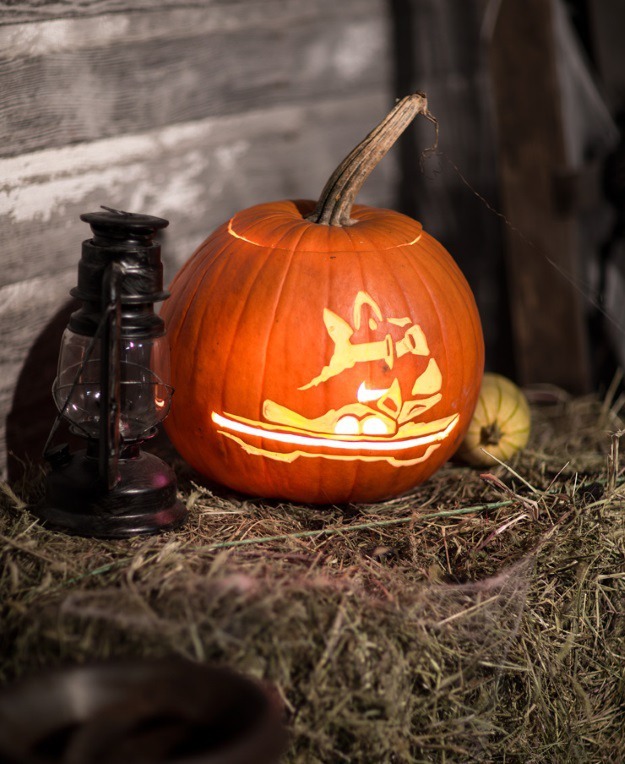 Pay homage to the coolest kicks on the silver screen by carving a Back to the Future pumpkin. You can find the pattern for this, and 14 other pop culture-inspired pumpkins, by clicking the link above. We won't [publicly] shame you for not stocking up on all things BTTF for Back to the Future day today, but we will go in full guilt trip mode if you don't snag some of these officially licensed costumes and accessories before Halloween 2015. There's still time - even if you DON'T have a DeLorean! We hope you've found at least one thing to read, wear, or craft, in our post so far. So know that YOU'RE all set, take a look at what WE'VE been up to! 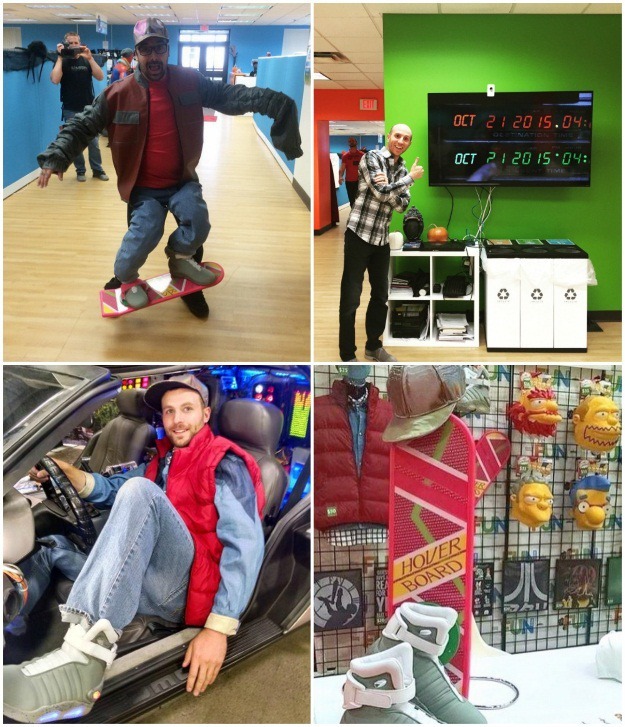 One of our resident superfans built a false perspective Marty McFly on a Hoverboard costume, which you can see here on the top left. Of course, we couldn't miss the chance to throw all the BTTF movies onto our flat screen at the office today, which you can see in the upper right. In the bottom two images, you can bear witness to some of our antics at Wizard World, an annual Minneapolis area Con. We had an oft-visited booth full of all things, you guessed it, BACK TO THE FUTURE! 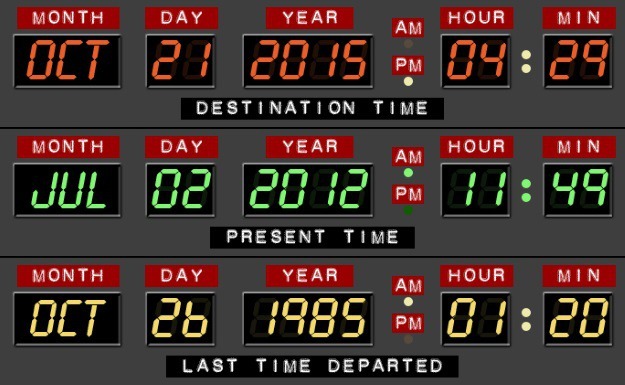 How do you plan to celebrate Back to the Future Day? Will you wait until precisely 4:29 PM PST to really start the celebrations? Let us know, or even send us pictures, in the comments section below. Great Scott we'd love to hear from you!